TKA Teknolabo A.S.S.I. s.r.l. produces an automated candling machines line to complete the vaccines production lines product. These machines were projected and realized to satisfay our custmers needs and requests, in order to simplify and make more comfort the vaccines production process. 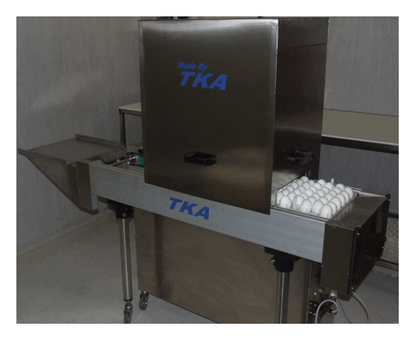 TKA offers a good quality eggs candling system, based on several years of test and study. This research brought constant, reliable and traceable results. The machines are protected by patents in its more sensible and delicate parts. The unit is stainless steel AISI 304 made or on request stainless steel AISI 316. These units can grant eggs candling speed starting from 12000 up to 24000 eggs/hour, depending on the eggs trays shape and on the machine structure required. 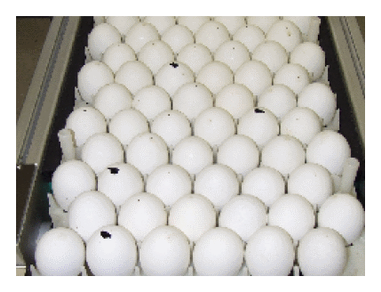 The machine can work with different size eggs starting from the seventh incubation day, allowing the eggs’ development process continuous monitoring. Each egg is deeply verified in order to classify its quality depending on the set specific parameters (non fertilized eggs, bacteria or fungi contamination, haemolysis presence, embryo grow level, vascularity quality, etc...). The machine can be completed with a waste eggs marking system in order to simplify the waste eggs removal. An automated system for the eggs removal can be installed on the unit to speed up the candling operations. The candling machine can be installed directly on the production line, on both harvesting and inoculating lines, reducing the costs and the manpower by increasing the productivity. The particular care for the project of these machines makes all the cleaning and maintaining operations extremely simple and fast.